Choosing garage blueprints that will suit your needs the best requires looking at lots of different options. There are thousands of ready-made garage designs available online, as well as in the plan books and magazines that you see at the local home improvement store. The ready-made garage designs are usually considerably less expensive than having a custom set of plans made for you. However, it is quite possible that none of the ready-made plans are exactly what you want or need. Some may not meet local codes for wind or snow loads (or earthquakes for those of you in certain regions!). Even if you hire a local architect to design the building for you, it is still a good idea to give them something to work from. If you find a garage blueprint that is somewhat close to what you want, it will give the architect a starting point. When they have an idea of what you want up front, it can save a considerable amount of time and hassle. You may even want to provide the architect with several different garage blueprints that contain various elements that you want included in your design. Garage Building 101 has a great package of 58 garage blueprints for detached 1, 2, 3, and 4 car garages, carports and workshops. Some designs have lofts for storage, and many of the plans are designed to be expandable so that you can easily add one or more bays later. He also provides links to lots of great info, including a 225-page carpentry manual. I actually purchased this package, and I am pleased with what I got for the price. For more details on what's included, take a look at my page on detached garage plans. This package is provided by Donald Berg, a professional architect and author who has published 15 books. His work has appeared in a number of magazines and other publications. He also has several other packages available if you are planning on building a barn, a workshop, or a shed. There is some overlap between the packages, so choose whichever package suits your overall intentions the best. You can download a free sample plan for an 8' x 12' storage shed to get an idea of the quality of the blueprints that are in the package. I have not purchased this package, so I can't comment on the quality of what is included in the actual package you get. Woodworking4Home.com: Another huge package with a bargain-basement price! The Woodworking4Home package contains 14,000 different woodworking plans, including more than 55 garage, shed, and workshop blueprints according to the vendor. It includes step-by-step instructions with photos and diagrams to help you avoid frustration when you build a garage. I have not purchased this package either, so I can't comment about the quality. TedsWoodworking.com: Even though this package focuses on woodworking plans, there are about 30 different barn, workshop, and garage blueprints included. This is yet another huge package of over 16,000 different woodworking designs. At the time of this writing, the package also includes a bunch of additional bonuses, such as videos, a CAD plan viewer, and a "Complete Woodworking Guide" e-book. If you are building a garage to use for woodworking, or are interested in woodworking at all, this package is a tremendous value! At the risk of sounding like a broken record, I have not purchased this package, and cannot comment on the quality of what is included. NOTE: I apologize if it seems I am pushing woodworking plan packages, that really isn't the case. Woodworking is one of my hobbies, and I discovered that these plan packages also include plans for building a garage, so I have included them here. Although all of the above packages are great deals for the number of plans you get, sometimes you need a little more. The companies listed above mostly provide PDF plans that you can print yourself, whereas the companies listed below sell complete, full-size engineering blueprints. Many are on the industry standard 24" x 36" paper, and some designs are available on erasable vellum. Most plans are also available as CAD files so your local architect can make modifications if necessary. If you need a blueprint reversed or modified, many of the companies below can do that for you. Although the garage blueprints offered by the companies below are more expensive than the plan packages above, sometimes you need the extras provided by the more expensive plans. The COOL House Plans Company has one of the largest collections of garage designs on the web. With over 600 individual plans by dozens of different designers, you are almost certain to find one that suits your needs. They offer lots of options including plan modification, reversed blueprints, CAD files, reproducible masters, material lists, and PDFs for many of their designs. All of their plans are provided in a 24" x 36" size. Because many of the same plans are offered for sale on different websites, COOL House Plans offers a low-price guarantee that they will beat any competitor's price by 5% on the exact same set of plans. ArchitecturalDesigns.com has approximately 350 garage plans listed, from dozens of different designers. They offer reproducible masters, reversed plans, CAD files, PDF files, material lists, and plan modification services. BehmDesign.com has 300+ garage designs available. All of their designs meet the International Residential Code (IRC), and come on 18" x 24" paper. The plan set package includes 4 copies of the garage blueprints, and some are available as PDF files so you can print as many copies as you like. Behm Design offers a free materials list before you purchase the blueprints, so you can more easily decide if a particular design fits your budget before you make a purchase. They do not offer plan modification, reproducible masters, or CAD files. I have spent hours looking at the plans on the Behm website, and highly recommend that you take a look at what they have. ePlans.com has been in business since 1946, and has nearly 350 different garage plans on their site. They also offer reproducible masters, reversed plans, CAD files, PDF files, material lists, and plan modification services. They have plans for both attached and detached structures, in one, two, and three car designs. 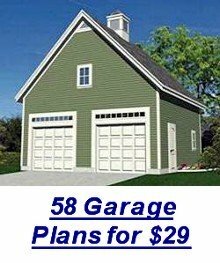 TheGaragePlanShop.com has approximately 600 garage plans for sale. They also offer reproducible masters, reversed plans, CAD files, PDF files, material lists, and plan modification services. GlobalHousePlans.com has nearly 500 designs available. They offer reproducible masters, reversed plans, CAD files, PDF files, and plan modification services. DesignConnection.com has over 250 garage designs available. They also offer reproducible masters, reversed plans, CAD files, PDF files, material lists, and plan modification services. 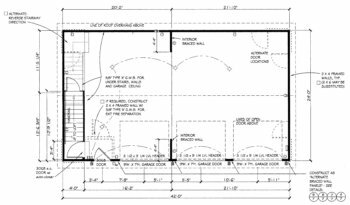 JustGaragePlans.com has hundreds of garage blueprints. They offer reproducible masters, reversed plans, CAD files, PDF files, and material lists. GaragePlansPlus also has hundreds of designs for sale. Every blueprint is designed to meet IBC and IRC building codes. You get 4 sets printed on 18" x 24" bond paper, and the material list is included at no extra charge. CadNW.com has over 130 garage designs available. Unlike most other companies, they do not charge extra for a materials list, a mirrored version, or a reproducible master. They can also make modifications to their designs, and CAD files are available. Those are some of the websites that have the largest selections of garage blueprints available. Many of the same garage designs out there are sold by multiple websites, so it pays to shop around once you find one that you like. I will be adding more resources to the list as time allows, but browsing through the list of websites above should keep you busy for a long time! Be sure to visit our Garage Building Plans page for links to more detailed info on choosing the right size and type of garage to suit your particular needs. You may also want to check out our other Related Pages for more detailed information. Deciding on a particular set of garage blueprints should come only after you know what size and type you are looking for.